UsIng Glass Fusing Molds To Maake Kiln Formed Bracelets. Fused glass bracelet molds are needed to make kiln formed glass bracelets, however it is not always easy to produce accurate bracelet sizes. 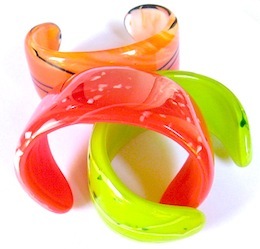 Glass bracelets can be made from a large range of art glass colors as well as being capped with dichroic glass. Usually made from two layers of glass, three layers can be used to provide extra strength and durability. Fusing glass must first be cut to size and ground to shape if necessary, then fused in a glass fusing kiln. If further grinding is required then the blank will need to be fire polished prior to being placed on a bracelet mold. A number of molds are available to cater for differing wrist sizes. Some of these glass bracelet molds can be seen in the pictures below. Some of these glass bracelet molds can be seen in the attached pictures. This is a general purpose mold used to produce bracelets for medium wrist sizes. It has a slight oval shape. This mold is designed for small wrists. It can also be used to make separate pieces for watch bands. Napkin rings can also be made from this mold. This mold is produced by Jane Persico who has written a book on bracelet making. Jane also produces special tongs for bending the bracelets. It has a more oval shape and has the legs screwed to the center section. These glass bracelet molds are all designed for use in small tabletop glass kilns, but can be used in other styles of small kilns. Due to heat factors, it is not recommended that they be used in large glass fusing kilns. To use a bracelet mold it must first have a layer/layers of pre-fired fiber paper wrapped around the mold, held in place with a strand of high temperature wire. Fiber paper is used not only to prevent the glass sticking to the mold, but as an aid in adjusting the bracelet size. The paper is pre-fired to prevent paper biders leaving devitrification marks on the glass. Make sure that the kiln is placed in a well ventilated area before pre-firing paper. Pre-cut 1/32" fiber paper can be placed in a stack of 3-8 pieces and fired in a vented kiln at about 1400° F(760° C), at this temperature all the paper binders should be burnt off. When smoke and smell have disappeared, the kiln can be turned off and allowed to cool. Carefully place the paper in a plastic bag and store away. Handle gently as it will be fragile. A number of issues can arise when attempting to kiln form glass bracelets in a tabletop kiln. Because many kilns heat from the side and the heating elements may not be above the bracelet mold some hot spots may be present. Problems can arise when slumping the bracelet legs, one leg may slump ahead of the other. By the time the second leg has slumped the first leg may have stretched, making the bracelet unusable. Too much heat can result in both legs stretching before they can be bent into shape. Special graphite paddle tongs are used to shape the bracelets and must be heated prior to use to prevent the cold paddles leaving cracks in the glass. The tongs are placed on the shoulders of the bracelet and rotated down one side, keeping even pressure on the glass, pressing the leg inwards, and then moved down the other side without lifting from the glass. During this process, the ends of the glass are pressed in as far as possible. Care must be taken to ensure that the glass does not become too cold when bending the legs as the glass may move around the mandrel before the bending process is completed. If the glass is not out of shape the kiln can be re-heated and the bracelet moved around. Under normal circumstances, the glass may need to be heated again to complete the bending process. It can be a bit difficult to form your first few bracelets, practice with two layers of scrap glass until you are used to the bending process. Some glass artists prefer to use a deeper kiln than a small tabletop model as the heating elements are higher and may even be in the lid. We no longer use a tabletop kiln for kiln forming bracelets. All our bracelets are hand bent and are made from three layers of glass for strength and durability. The bracelet blanks are cut to size, shaped on a grinder, and then fused. Blanks are then placed on a prepared Fireworks bracelet mold and bent in a Paragon SC3 front loading kiln that has elements placed high in the firing chamber. It is mounted waist high on a table and the mold is placed length ways in the kiln with the bracelet at the door end. Once the legs have slumped and wearing hot work gloves rated at 2000° F the legs are bent by hand. DO NOT attempt to do this with low rated gloves as serious injuries may occur. The glass cannot be allowed to become too soft or the glove pattern will be imprinted in the glass. Always turn kiln off before working inside, never introduce a metal object into a kikln that has not been turned off. Full facial protection and dark kiln glasses must be worn as well as appropriate protective clothing. This technique should not be attempted by inexperienced kiln artists. One of the difficulties with bracelet making is producing an accurately sized bracelet as all wrist dimensions vary. 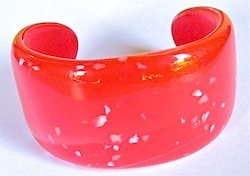 Unlike metal bracelets, glass bracelets are inflexible and will not stretch. Glass bracelets are slid across the wrist and then twisted into position. A standard fused two layer bracelet is usually 5 7/8" and will fit 90% of the population with a wrist size of 6 1/2" to 7", usually bent with one piece of 1/32" fiber paper on the mold. If adding another layer of glass then the length should be increased by the thickness of the extra layer. Jane Persico in her book Kiln Formed Bracelets published by Wardell Publications Inc.has a very detailed measuring chart covering a large range of wrist sizes. Additional sizing information can be found in the book The Exotic Art of Glass Bracelet Forming by Ron Bearer Jr & Rocio Bearer published by Diamond Tech International.